For the first time ever an affordable replica is available of the hockey mask worn by Jason in Friday the 13th Part 4: The Final Chapter. 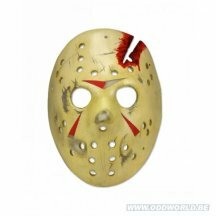 Made from resin and hand painted, includes leather-like straps so you can wear the mask or hang on the wall for display. Includes the cracked battle damage wound with bloody deco!! Accurate to the film in every way.